This fine bouquet is inspired by one of the most famous British paintings of the 19th century – Monarch of the Glen by Sir Edwin Landseer. The sight of the twelve point stag staring into the distance evokes great emotion and reverence. Each element of this fine National Gallery flower arrangement has been carefully selected to reflect this painting. The twisted willow represents the stag's impressive horns while the fragrant Naomi roses represent his colour, texture, and temperament. To accurately capture the natural beauty of the fields, we used a combination of limonium and green bell (thlaspi). 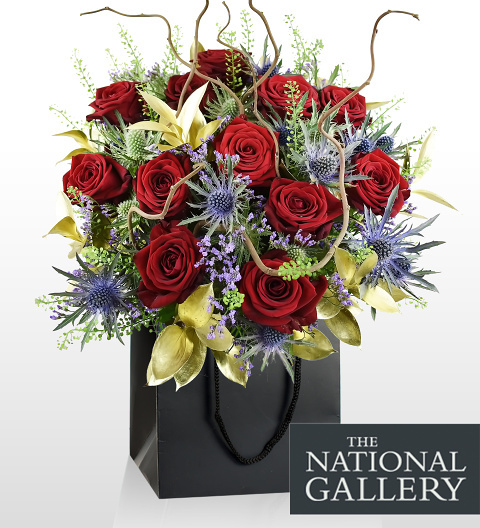 The thistles (eryngium) give this bouquet that touch of Scotland while the golden ruscus represents the hazy sky. If you are looking for a bouquet that will impress any recipient, this luxury flower arrangement will certainly do just that! 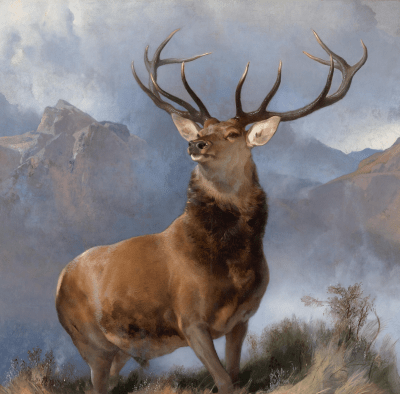 Most notable of all is that this proud stag will be on display at the National Gallery in London this Christmas for the first time since 1851. For many, this will be the first opportunity they have to get a closer look at this famous masterpiece.